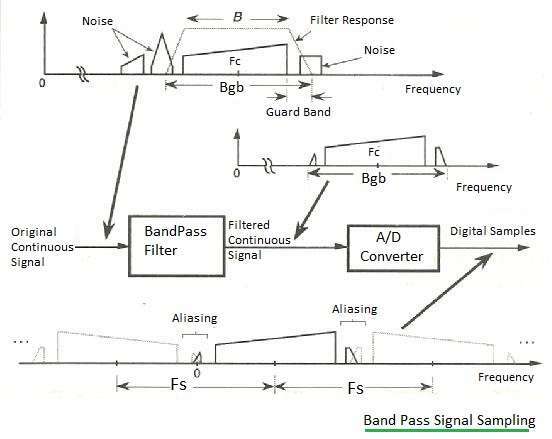 This page on low pass sampling vs band pass sampling describes basics of sampling of low pass signals and band pass signals and mention difference between these sampling techniques. Figure-1 depicts Low Pass Signal Sampling process. 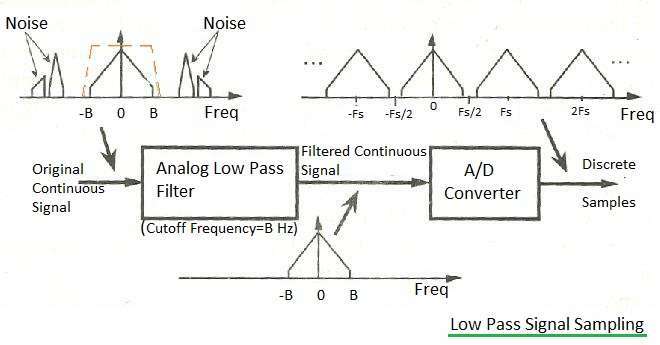 As shown, low pass analog filtering prior to sampling the filtered continuous signal at the rate of Fs Hz. Figure depicts that input spectrum to be sampled is symmetrical about zero Hz. The spectral amplitude is zero above +B and below -B Hz. If the signal is sampled at Fs samples/second than we see spectral replications along with the original input spectrum. The period of replication is about Fs Hz. In Practical A to D Conversion, Fs is always kept more than 2B which separates spectral replications at folding frequencies of +/- Fs/2. The relationship Fs > 2B is known as Nyquist Criteria. It (i.e. Fs/2) is also referred as folding frequencies. It is to be noted that frequency overlap and aliasing occur when sampling rate is too low due to Fs/2 < B . In actual condition, noise is present along with signal of interest outside the frequency of +/- B as shown. Sampling this (Signal+Noise) will prevent overlapping between replications of signal of interest. But this results into noise components in the range between -Fs/2 and +Fs/2. This corrupts the signal of interest. This problem is resolved using anti-aliasing filter before A/D converter. This filter attenuates all the unwanted signal components present above +B and below -B. Figure depicts low pass filter response in dotted line. Due to this design, spectral aliasing can be avoided at the output of A/D converter. Figure-2 depicts Band Pass Signal Sampling process. This technique is employed to sample continuous bandpass signal centered at frequency other than 0 Hz. Band Pass Sampling performs two functions viz. digitization and frequency translation. This two functions performed are collectively known as sampling translation. In order to avoid aliasing, following is the range of sampling frequency (Fs). Fs is used as per this range for band pass sampling. Here m = any positive integer such that Fs >= 2B.